When one thinks of an "export," one normally thinks of objects that are boxed and loaded onto container ships in Galveston or Long Beach, like manufacturing or agricultural products. But since it involves the consumption of U.S. goods and services with foreign currency, international travel and tourism falls into the "export" category as well—and it greatly outperforms most other U.S. industries in that capacity, according to a new study from the U.S. Travel Association. "Travel's potency as a job creator, tax revenue generator, and positive contributor to domestic GDP are all well-documented and well-known," said U.S. Travel President and CEO Roger Dow. "We frequently have to remind people that travel is also a top performer for the U.S. trade balance, which is always a top economic priority for political leaders. When they grasp that, it's easier to talk to them about the policies travel needs to grow and perform even better—like improvements to the Customs entry process, expansion of the Visa Waiver Program, and urgent attention to our surface and air travel infrastructure." Dow continued, "The single greatest point to remember about travel is that it creates jobs that cannot be outsourced abroad. A concierge or tour guide or sales executive or general manager cannot possibly perform their job from a phone bank in Bangladesh. When overseas visitors come here with the $4,500 they spend per trip on average, the economic benefits stay right here." • Travel exports grew 72 percent faster than travel imports from 2003 to 2013, with the travel trade surplus now standing at $78 billion. By contrast, the trade deficit in all other U.S. goods and services deteriorated by $44 billion. • Travel is more labor-intensive than other industries. 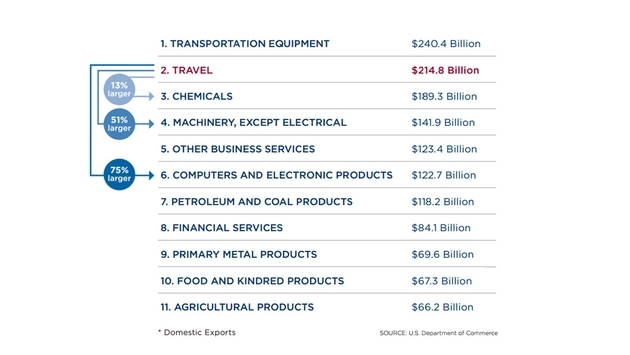 $1 million in travel exports supports 6.6 American jobs—far more than the number of jobs in agriculture (2.0 jobs) or manufacturing (1.8 jobs) supported by $1 million in exports. •Travel has created jobs 42 percent faster than the rest of the economy since the 2007-2009 recession, reaching an all-time employment high of nearly eight million jobs in July 2014. • The jobs travel creates stay in the U.S. Firms outsourcing business activities to companies abroad account for 22 percent of sales in the manufacturing sector and 25 percent in finance and insurance. By contrast, firms outsourcing jobs abroad in the largest component of the travel industry—leisure and hospitality—account for a mere 3.6 percent of industry sales. "This study clearly illustrates the unique characteristics of the travel industry," said David Huether, U.S. Travel's senior vice president for research and economics. "It grows faster, exports more and creates jobs faster than virtually any other part of the economy. If just a few of U.S. Travel's policy priorities make it through Congress, the sky is the limit for what this industry can achieve for the broader economy." Click here to read the full study, "Travel Exports: Driving Economic Growth and Creating American Jobs."